Mark Sesnan, 63, Managing Director of Greenwich Leisure Ltd (GLL) will run the Virgin Money London Marathon for the first time on 28 April. All proceeds will go to GLL’s Corporate Charity Partner Cancer Research UK (CRUK). Mark heads up the borough’s premier not-for-profit charitable leisure social enterprise that runs 15 facilities - including Leisure Centres, Adventure Playgrounds, Childrens Centres, Libraries and a Performing Arts Academy in partnership with The Royal Borough of Greenwich. The enduring partnership - which has created hundred of jobs in the borough and made a significant contribution to the health and wellbeing of thousands of residents - started life 26 years ago. GLL now spans the country from Belfast to Bromley, Cornwall to Cumbria. Mark Sesnan said: “There‘s a nice symmetry in this because GLL started life in the Royal Borough of Greenwich and the London Marathon starts there too. “The race is 26 miles long – the same number of years GLL has been running Greenwich leisure centres. 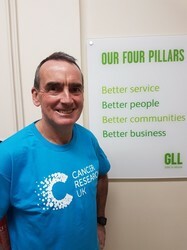 “This month I’m fulfilling a personal ambition by running the London Marathon in aid of Cancer Research UK raising funds for their vital scientific work, to help beat cancer sooner. Cllr Danny Thorpe, Leader of the Royal Borough of Greenwich said: “It’s great to see Mark fulfilling his ambition and running his first London Marathon - this is the perfect example of it’s never too late to accomplish your goals and he’s doing it for such a worthy cause. Mark was Assistant Director of Leisure for the Royal Borough until 26 years ago when he set up the new staff-owned social enterprise with other Council colleagues and the support of the Borough.